I read a book a while ago ( read many years, maybe a decade ago, it was at least 20 years old then) about a watery planet ruled over by a monstrous overlord sea monster thing. The hero rallies some of the floating villages to fight the monster and they make iron weaponry out of iron from blood as far as I can remember. Beyond this I can't remember much about the book, but I'm sure at least one other person out there must have read it. Edit for more potential details: I think the village folk were reluctant to trust the hero, he was maybe a stranger to them and a lot of them didn't want to upset the status quo. The iron weapons were maybe to pierce the hide? A harpoon seems familiar, something to trap him with the aid of nets. 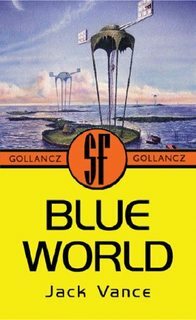 Jack Vance's The Blue World has all the elements that you talk about. In the distant past a spaceship crashed on the Blue World which consists of one gigantic ocean. The survivors discovered floating “pads” which are connected to stems which grow in clusters. [...] The primary purpose is to alert the other pads to the arrival of King Kragen and his lesser minions! King Kragen is a gigantic vindictive sea monster. The pads’ inhabitants have developed a policy of appeasing King Kragen who still occasionally wrecks havoc destroying buildings, eating sponges, and breaking nets. Sklar Hast, our rebellious hero, is an apprentice hoodwink (communication tower operator). Sklar believes that the policy of appeasement should be replaced with a policy to exterminate King Kragen so the pads can finally live without fear. He invokes the ire of the more traditionalist members of the the society. After an audacious attempt at killing King Kragen, Sklar Hast is forced to leave the pads with his followers. 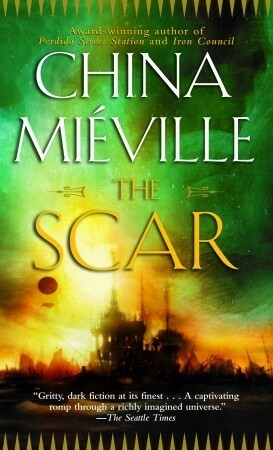 As per my comment, I'm going to put out the possibility of this being China Miéville's The Scar, second book of the Bas Lag Cycle. That last bit refers the the Avanc, a massive sea creature. The book also features the Scabmettlers, a race whose blood congeals very rapidly, with which they create their own weaponry and armor. It's a more recent book (2002), but that's still fourteen years ago. It's not a watery planet, just one section that's got a lot of water (although, frankly, so does Earth). The sea creature gets raised later in the book. Honestly, it's not the best match, but it's close enough that I figured I'd posit it. Name of the book/series based on magicians who tap into computer grid? Science fiction book based on a Jupiter-sized wandering/rogue planet?